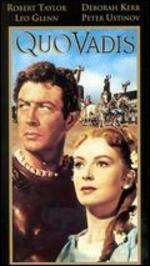 Robert Taylor; Deborah Kerr; Leo Genn; Peter Ustinov; Patricia Laffan. New. Run time: 171 mins. Language: English. 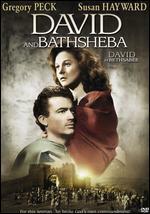 Robert Taylor, Deborah Kerr, Leo Genn, Peter Ustinov, Patricia Laffan. New. 1951 Run time: 171. Buy with confidence-Satisfaction Guaranteed! Delivery Confirmation included for all orders in the US. 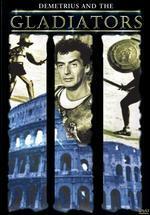 Robert Taylor, Deborah Kerr, Leo Genn, Peter Ustinov, Patricia Laffan. New. 1951 Run time: 174. Buy with confidence-Satisfaction Guaranteed! Delivery Confirmation included for all orders in the US. ***EXPEDITED SHIPPING IS AVAILABLE WORLD-WIDE***. As for me, I am a "small shop" retiree, prioritizing customer service. All "new" items, unless otherwise noted, are Factory Fresh/Sealed in Excellent Condition and will be mailed expeditiously. "Like New", "Very Good", and "Good" items have packaging conditions reflective of the listing. Not all used items will have inserts. Used discs themselves will be in very good to excellent condition in all cases. Note well: on occasion, discs may become dislodged from the center hub holding it in place within the sleeve. This is not a defect, nor should you presume the item to be damaged. It is not an uncommon occurrence, signaling minor cosmetic consideration solely and, again, does not impact, in 99% of the cases, the quality of the DVD provided. 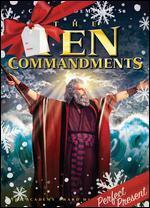 As is always the case, damaged DVDs may be returned for credit within the timeframe provided by ALIBRIS. 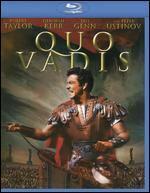 All Releases of Quo Vadis? 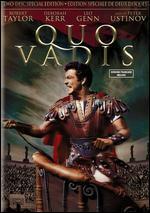 Quo Vadis is latin for: Where are you heading to ? 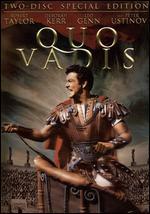 This 1951 Pacesetter in vivid colour had eight Oscar nominations and led the way to all the other Roman (or Sandal & Sword) epics to come. 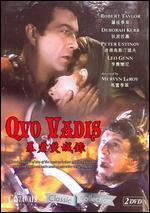 Actors Leo Genn, and Peter Ustinov are simply brilliant and worth seeing onece a year as a change of pace from the usual computer-enhanced, violence-filled movies of today ! This is the one all the rest are trying to better. 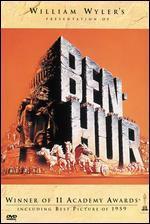 "Ben-Hur" and chariot race? 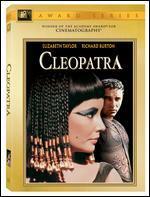 This has that and more: Nero gone mad; the burning of Rome; Chritians and lions; Christians and burning at the stake; hundreds of trumpeters; thousands of extras; authentic costumes; sets; dialogue romance and heartache;betrayal. All the subplot themes are covered The DVD extras present a historical look at how this plays against the rest and gives an indepth chronicling of the twenty odd years it took to get it made. There is a dubbed commentary by a knowledgable film historian. The two disc set has been digitally remastered so the visual quality does not seem like it is from a sixty year old work.